Green Bay - Anna Maria Van Rybroek (van Rijbroek), née van den Oever, 96, formerly of Appleton, passed away at McCormick Assisted Living on July 10, 2018. As she wished, she was surrounded by family in her final days. She was born in Veghel, Noord Brabant, the Netherlands on November 6, 1921. In 1952, she and her husband, Harry, emigrated to Appleton, Wisconsin where they raised their family. Harry preceded her in death in 1989. She moved to Green Bay in 1991 to be near her daughter and family. Anna’s family includes her 3 children: John (Jean) Van Rybroek, Solon, Iowa, Gregory (Diana) Van Rybroek, Madison, and Mary Ann (William) Hitch, Green Bay. 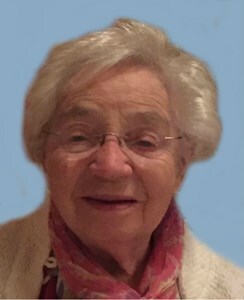 Her Van Rybroek grandchildren are Jana (Matt), Pieter (Ashley), and Chris (Kirsten), Dirk, Anneke and Marieke. Her Hitch grandchildren are Alex (Elizabeth), Nick, Greg, and Annemarie. She has 3 great grandchildren - Miles, Maisie and Ezra. She was preceded in death by her husband, her siblings and in-laws, all of whom resided in the Netherlands. Her celebration of life mass will be at McCormick Assisted Living Chapel on Saturday, July 21 at 9:00am. Reception will follow in the activities room. Many thanks are extended to every staff member at McCormick - each of you is truly special and you gave Anna wonderful, loving care every day. Thank you to Unity Hospice - you gave all of us and our Mum and Oma great comfort and advice in these final weeks. Thank you to Dr. Abdel-Halim and Dr. Ai, and the Prevea staff, for their kind care over the years. Memorials can be directed to McCormick Assisted Living or Unity Hospice. Add your memories to the guest book of Anna Van Rybroek.